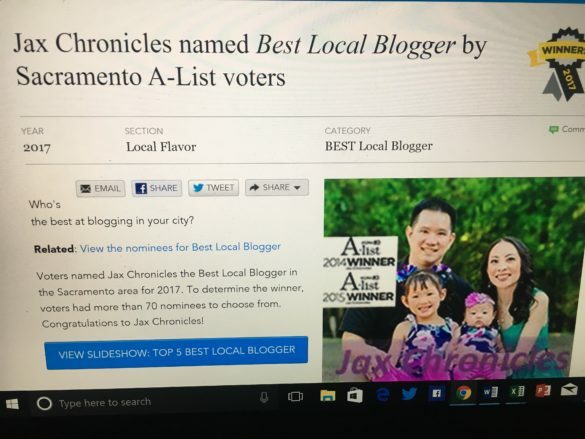 I just found out Jax Chronicles won Sacramento A-List Best Local Blogger 2017!! Thank you from the bottom of my heart to all my family, friends, and readers!! Thank you for loving me, supporting me, and voting for me!! I don’t take any of this for granted. This blog is what it is today because you have helped to support me. This blog isn’t just a blog to me. It is my job, my passion, and it helps me to lift up my family and other families in our local community. THANK YOU! I also want to give a huge shoutout to my fellow Elk Grove bloggers Ashley Newell of AshleyNewell.me and Felicia Leo Kemp of Family Trail Time: A Mama’s Guide To Hiking for making Sacramento Area A-List Top 5 Local Bloggers!! ELK GROVE REPRESENT! !